The Gentlemen's Monthly: Rededication Day. 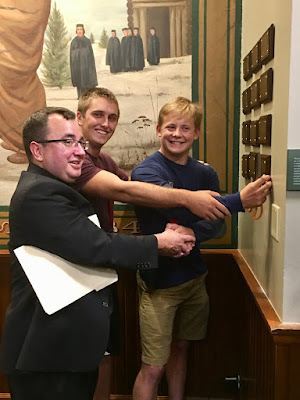 Founder's Week commenced with "Rededication Day.” Once again, Stedsmen gathered to rededicate the Rededication of the Rededication of… the Dedication of the Gregorian. Originally called the Sorin Society Room, it was forgotten and lost for a number of years. Rediscovered in the early 2000’s when a fake wall was removed, the mural was restored at great cost. Painted by Luigi Gregori- the artist who painted the University's Basilica and Main Building- the room was dedicated to his memory in 2006. This year’s Rededication saw a dramatic reading from Theodor Geisel, Dr. Seuss, and his Green Eggs and Ham, by Hall Senator, Chris Scott, a phone call from California with Frank Spesia, past Resident Assistant, dialing in and sharing a moving story about his memory of the room as well as a reading of past resident from 1893. With Vice Presidents Kimlinger and Lupo present, President Trzaska cut the ceremonial ribbon, opening the room up again. And thanks to Dan Riley and there was a musical fanfare via a portable Jambox as the ceremonial ribbon was cut. Thanks indeed... and may the Founder continue to smile on all of you!